I love it when I use my gluten free flour in a traditional recipe and the flavor and texture turns out so well. This is an example of one of one of my many triumphs. 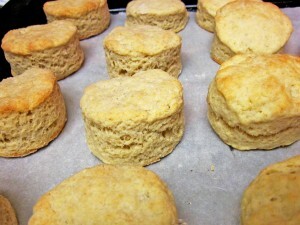 I have had a recipe for simple biscuits on hand for a very long time. It had been a while since I made them. The family was eating breakfast out a little while back and something occurred to me… my oldest son often orders biscuits and gravy, and I don’t think I have ever made gravy from scratch for him. Well, now I can say I have. 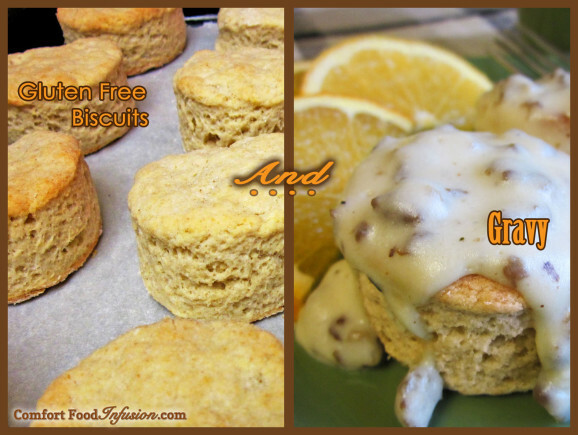 The recipe in this post is for the biscuits, but the next post will be for my gravy. As with most of my gluten-free baked goods, you can use traditional flour in it’s place. Pictured below are both gluten free and regular flour biscuits. Can you tell the difference? In a medium bowl combine flour, baking powder, xanthan gum (if using), sugar and salt. Mix well. Add shortening, and using a pastry cutter, blend until the mixture resembles coarse crumbs. In a separate small bowl, beat the egg into the milk. Pour the egg and milk into the flour mixture and stir until just moistened. Turn onto a floured surface and knead about 15 times. Roll to approx. 3/4 inch thickness. Using a biscuit cutter (or empty tin can), cut out biscuits and transfer to a baking sheet. Bake at 450° for about 8-10 minutes or until the tops begin to turn golden brown.